Stevia is a natural non-calorie sweetener produced by the stevia plant. Used for centuries to sweeten food without added calories, it has become a popular non-calorie natural sweetener in the United States. Stevia was just recently released as the alternative sweetener Truvia, as it was sold for many years as a dietary supplement. Stevia powder is derived from the Stevia rebaudiana herb that grows wild in Paraguay and Brazil. The glycosides are the compounds in the plant that give rise to the sweetness stevia creates. 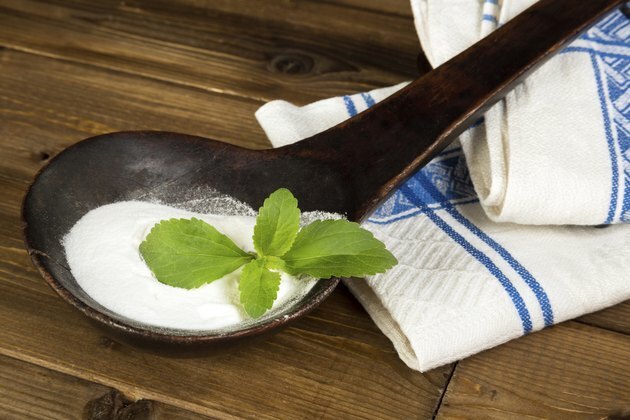 According to stevia.com, the glycosides are 300 times sweeter than sugar, which allows stevia to provide all the sweetness, but not the calories, found in regular sugar. Using stevia powder may present some challenges. Since the powder is 300 times sweeter than sugar, the amount used will vary from the amount of sugar you will need to create the sweet flavor you desire. For example, a recipe may call for one cup of sugar; the equivalent of stevia is 1/3 to ½ tsp, depending on the sweetness you desire. That is a big difference in concentration and volume. Sugar does more than just sweeten our foods. For baked goods, it helps brown and provides bulk in cakes, pies, and cookies. While replacing the sugar is a good thing for calorie reduction, the amount of stevia powder used may not develop dough or impart the browning qualities of sugar. Inulin is a non-digestible fiber used to improve the usage of stevia extract. Mixed with inulin, stevia can be converted in recipes one to one with sugar as listed on stevia.com. Sold commercially in packets, stevia inulin blends can be used in hot or cold products, just like sugar. Commercially, you can find this blend being sold as Sweet Leaf. Using stevia with erythritol produces a product very similar to regular sugar. Erythritol is a sugar alcohol produced by fermenting vegetables. Erythritol is also a non-calorie sweetener and mixed with stevia to enhance the flavor of stevia. It's easy to use in recipes that are baked, as the blend can be used in amounts equal to sugar. Commercially, this blend is sold under names uch as Truvia and Z Sweet. Stevia powder is also mixed with maltodextrin to enhance your ability to use it in hot and cold items. Adding maltodextrin does not increase the calorie level of the sweetener; it's just another agent used to enhance flavor and use of the stevia extract. If you are allergic to corn, you may want to avoid this blend, as corn is a chief source of maltodextrin as reported by The Sugar Association. This blend is sold commercially as NuNaturals. Is Sucralose Bad for Pregnant Women?